For those that wanted to customize their Windows 10 PC further using trusted third-party softwares, we got you covered. We have been sharing different customization tools since the middle of the year that enable Windows users to customize various part of their desktop to enhance usability, improve multitasking, and to make the desktop more beautiful looking. We recently shared how to add a customizable floating bar on the desktop to pin your favorite apps, folders or files for easy access, and before then we also shared how to add gadgets on Windows 10, the likes of which were seen on Windows 7. Today, however, we will be showing you how you can change the color of the tiles on your Windows 10 start screen. By default, the app tiles on the Windows 10 start screen use the color of the theme applied under Settings -> Personalization -> Themes or the default color chosen under Settings -> Personalization -> Colors, but with the software we are about to share you can color-coded each app tile to your favorite color. The software let you change the color of each tile to your preferred color without making advance changes to your Windows settings or tampering your system files. It is a one-click solution that we found amusing. The Windows Tile Color Changer as called, is a portable software program that you do not have to installed and that can be carry around in a flash drive. It does only one job, and that is to change the colors of your Windows 10 start screen app tiles to whatever colors you want. 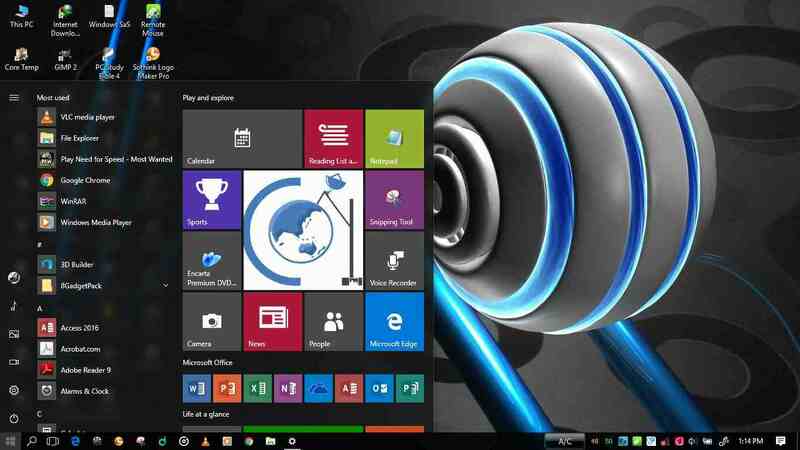 The software, developed by Lavish Thakkar for the TheWindowsClub, was primarily created for Windows 8/8.1, but it now supports Windows 10. 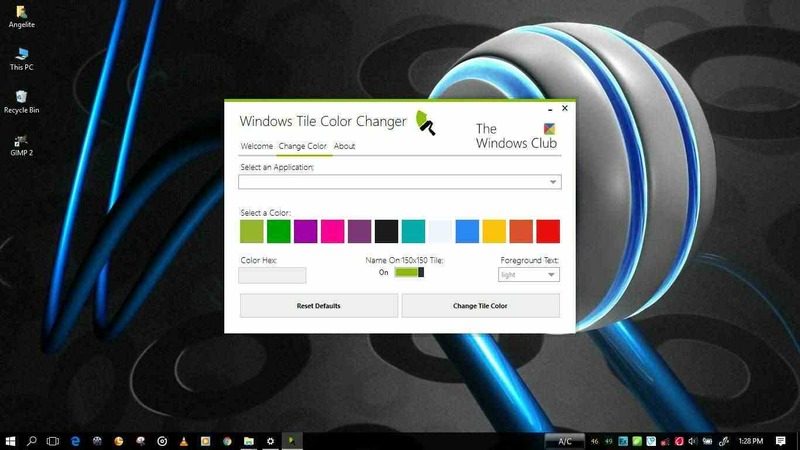 Windows Tile Color Changer is a freeware so you don't need to pay to download and use it. You can download it from here. It comes in a zip format; extract its content to your desktop using winrar or winzip and follow the steps below. 1. Open the "Windows Tile Color Changer.exe" file among the extracted files. A welcome window will open up. 4. Select the color you want to change the tile to from the color tray, or insert the hex code of the color you want in the "Color Hex" box. Click the "Change Tile Color" button and see the magic. You can reset the tile color back to default by selecting the app from the drop down box and clicking the "Reset Defaults" button. It has been tested and confirmed to work on Windows 10 Anniversary Update and Windows 10 Fall Creators Update. 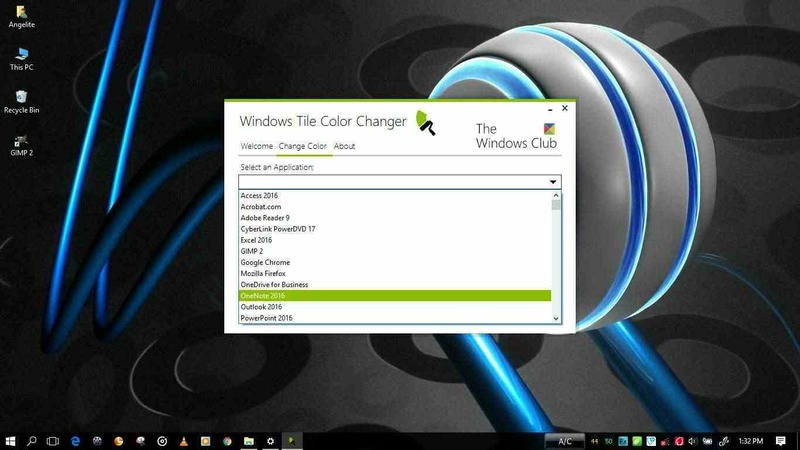 Windows Tile Color Changer works for system (pre-installed) applications as well as user installed applications. For the software to do its job make sure the application is pinned to the start screen. Unfortunately, not all pre-installed applications are supported at the moment. Do you faced any issue? Do let us know in the comment box.